By harrisonca on December 15th, 2009 . Filed under: Crafts, Cupcake Ideas, Holidays, Recipes . 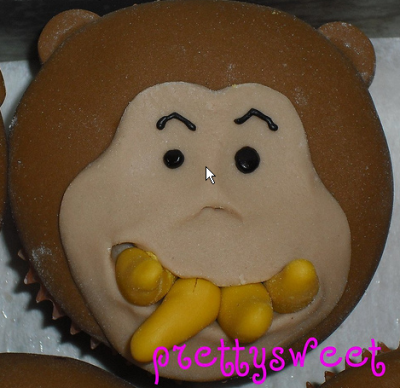 In this spirit, I also want to share my favorite Monkey Face Cupcakes. I’ve had a blast making these with my kids, and they had a great time eating and playing with the fondant as if it was Playdoh. Any cupcake cake or icing would be fine as the fun part really lies within making the monkey faces toppers; hoever, if I were making this to impress, I would match it with this Banana Bread Cupcakes with Cream Cheese Frosting recipe. Another option would be to not make an entire head, but just the face. The face can then be applied on top of the cupcake and icing similar to these cupcake below from prettysweet boutique.